of each panelist's pattern consistency with the Panel's overall pattern. Reps are combined if applicable. responses to attributes for each rep of each sample by each of the panelists. This report is intended for use with your tests with 2+ samples with any number of reps. 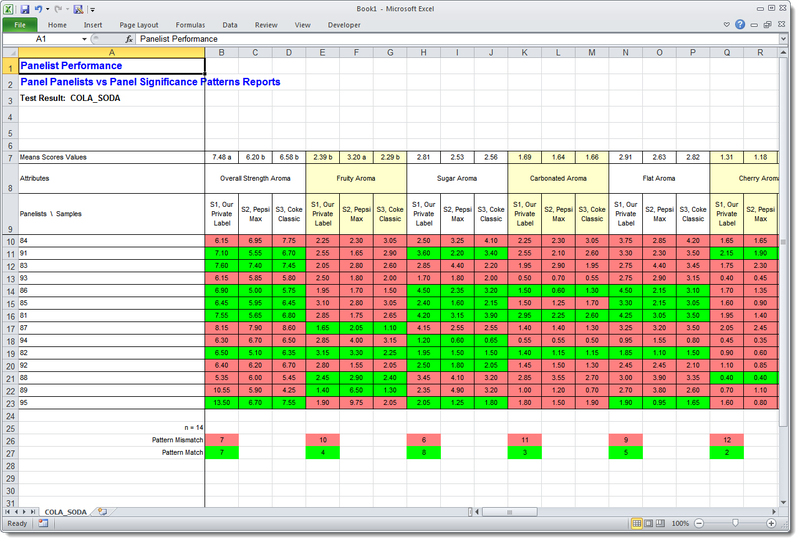 Attributes types included on the report are Line Scales, Hedonics, and Grouped Intensity. 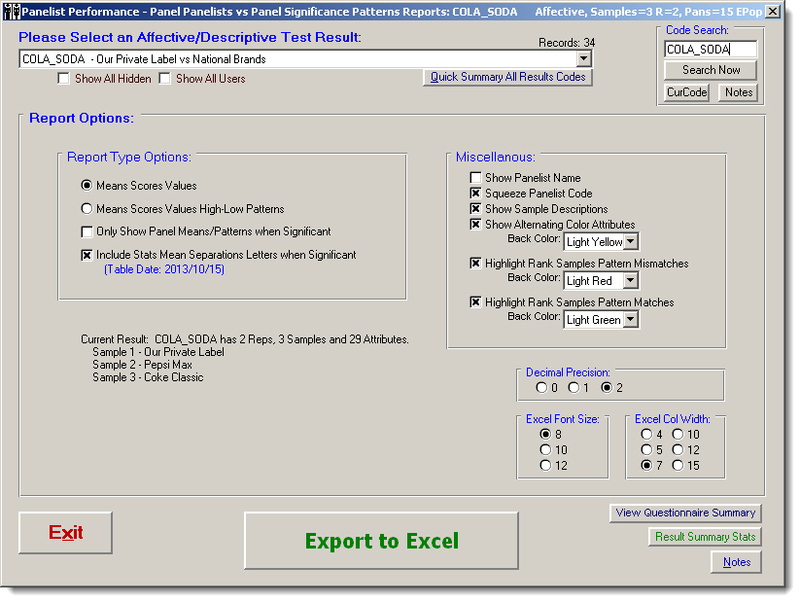 Panel single row shows the panel's mean score calculations for each Attribute/Sample. Panelist rows show each panelists raw data test scores, multiple rep tests are combined means if applicable. Pattern rank 1-2-3 of the sample ranking for each attribute, where 1 is highest rank. Panel single row shows the entire panel's rank of calculations for each Attribute/Sample. Panelist rows show each panelists rank of raw data test scores, multiple rep tests are combined means if applicable. If this option is desired, you need to have first run statistical analysis PRIOR to this report. See SIMS Main Menu | Statistical Analysis. Omits the Panel row of Means/Patterns for any Attribute where the previously run statistics did not find sample significance. Letters will appear on the Panel row of Means/Patterns for any Attribute where the previously run statistics did find sample significance. The mean separation letters will be exactly as it was from the previous statistical analysis. Allows for optional showing of the panelist name on report, otherwise only the panelist code will be displayed. Allows for optional squeezing of the panelist code, example 0000001234 will be squeezed to 1234. Background cell color simple contrasting from attribute to attribute moving horizontally. Example:  White, Light Yellow,  White, Light Yellow,  White, Light Yellow,  etc. Background cell color for panelist if their responses exactly match the Panel's Rank Samples Pattern.